Steel trauma plates are increasing with popularity due to cost, thickness and multi hit capability. There have been some advances in the cut and bending. Advanced coating materials are being applied to the steel to help reduce splash. Overall a better steel trauma plate is being produced. TheTargetMan is one of those manufactures that is taking steel trauma plates to the next level.Trying to find a plate carrier that will hold these steel plates correctly has been difficult until now. 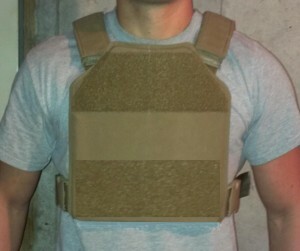 We have designed an new AR500 Omega Armor Plate carrier. Here are a few pics of the prototype design process as we built the AR500 Omega Armor plate carrier. We are testing a simple way to connect AR500 Omega armor side plates to the plate carrier. This design uses four 1” quick release buckles. We added a tri-glide on the side plate pocket to hold the side plate pocket in place and allow for adjustment. One of the unique features that we have incorporated into the Plate carrier is our PC pads. 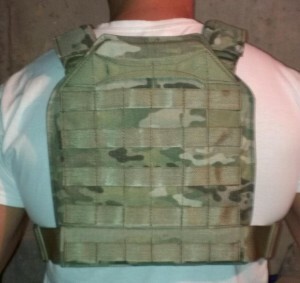 On both the front and back inside of the plate carrier are two rows of vertical loop velcro. The vertical velcro allow you to attach additional padding with our PC pads. The PC pads add additional comfort and airflow. The velcro can also be used to attached a soft armor backer to help with spall if not used with soft armor. As you can see the AR500 Omega Armor plate carrier holds these plates like a glove and is very low profile. We have a couple different plate carriers in the works to support the AR500 Omega Armor trauma plates. This is our molle version of the AR500 Omega Armor plate carrier. There is plenty of molle real estate to attach pouches. The low profile drag handle is a nice addition to this version. There is also plenty of velcro for ID, blood type or group patches. The AR500 Omega Armor Plate Carrier is available in Multicam, A-TACS AU, A-TACS FG, Coyote, Khaki, Ranger Green, OD, Woodland and Black. 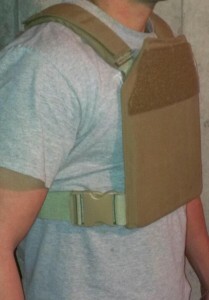 A customer sent us a few pics of his Beez Combat Systems tactical assault gear while doing some training at the range. He is running four pieces of our gear with different colors and camos.The mix and match is very reptilian and looks effective for the terrain. Let‘s take a look at his setup! The Khaki body armor BALCS LBAV carrier supports BALCS cut body armor and has plate pockets to support hard armor. The BALCS LBAV carrier is very low profile, with adjustable shoulder straps and has four heavy duty elastic side straps that allow soft and hard armor to be worn comfortably. The AR LE/RECON chest rig is a low profile chest rig for AR style mags. It is available in a 4 mag or 5 mag versions. As you can see there is plenty of molle real estate across the front of the rig for additional pouches. By far the most popular feature is our unique pull-forward lat strap design. The pull-forward design allows you to easily adjust your chest rig while on your body and on the move. The lightly padded harness is a simple solution to add comfort, function, stability, and enhance performance to our chest rigs. It is the perfect mounting platform for a hydration carrier or small molle pack. The hydration carrier is designed to work with the padded harness and easily integrate with our chest rigs. Will hold up to a 3L bladder. The top four rows of webbing are used to connect the hydration carrier to the padded harness. The two inch vertical pieces of webbing provide chest rig waist strap adjustment for different torso sizes. The two pieces of one inch webbing between the two inch vertical webbing pieces are mounting points for a molle platform. This picture shows how the Padded harness, Chest rig and Hydration carrier can be combined together into one functional system based upon the operators needs. The entire BCS product line is available in Multicam, A-TACS AU, A-TACS FG, Coyote, Khaki, Ranger Green, OD, Woodland and Black. We have been working on a new Plate Carrier and a couple different version designed to support the AR500 Omega Armor Trauma Plates made by TheTargetMan. The plate carrier has been designed to fit these plates like a glove. The steel plates do not have the same dimension as ceramic plates on the market. The plates are about ½ inch thick and have a slightly different angle.. Each plate weights in right around 7lbs. On this version we added the molle and drag handle. The waist configuration is a 2” webbing with 2” quick release buckles on each side. We have other versions in the works. The low profile no molle version was the first prototype as we played with the design. The production model will have velcro loop across the bottom. We build a broad range of body armor carriers and plate carriers for the security professional in many colors and patterns. The picture above is from a client of ours; a security consultant and security contractor out of Orange County, California. 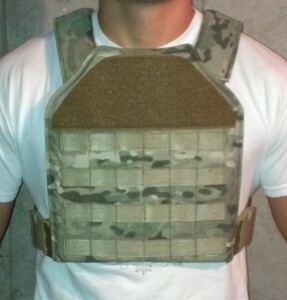 We’ve sold him several body armor carriers in the past; including a few custom body armor carriers. 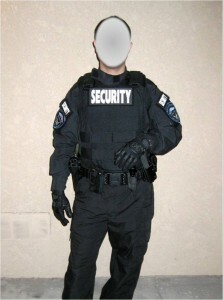 We work hard to provide quality body armor carriers and keep our turn time to a minimum If you are a security professional and need to give your body armor carrier a makeover let us know.